I have had thoughts of battening down the hatches to hibernate indoors with a stack of DVDs and warm blanket for the month of August. But being a little on the OCD and ADD side of the scale I’d be like a wild squirrel stuck in a tiny cage sorting out the newspaper scraps that were used as padding for the base of the cage, but now in perfect chronological order, if I were given nothing else to do, play with or create. So, I’ve devised a little plan, and invite you to join me for a month of preening and pampering from top to toe. There’s no better time to create mini at-home spa sessions, either by yourself, with your lover, or with a friend or two. It’s all about hair. Gift yourself (your loved one, or loved ones) a hair treatment. Gently massage in to scalp and hair. Leave for at least an hour (or overnight if you dare) and then wash hair. From luxe to less, I’d recommend the following to help replenish dry brittle hair, leaving your hair looking shinier and feeling softer. Unveil a brighter, smoother and clearer complexion with a face mask so pure and packed with antioxidants, you’ll be tempted to have a lick. Best applied during an evening where you can sit back and relax for a good half hour whilst the mask is working its magic. From luxe to less, I’d recommend the following detoxifying treats that deliver dramatic results. I personally believe that the body deserves the same amount of love and care that we gift our face, in regards to skin care. Which is why our signature Be genki Body Oils are packed full of ingredients that you commonly find in luxury skin serums. The base organic cold-pressed ingredients of sunflower oil, hemp seed oil, avocado oil and rose hip oil are extremely nourishing, readily absorbed, and dramatically enhance the appearance of your skin. Say bye-bye to dry scaly legs. 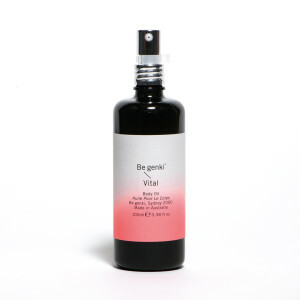 Begin your day with a dry body brushing, shower and application of Be genki Vital Body Oil. 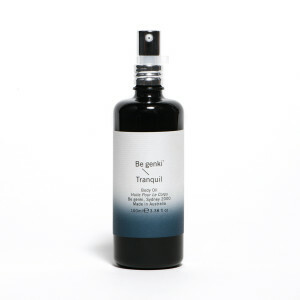 End the day with an application of Be genki Tranquil Body Oil. After a week of doing this my skin is so uber soft, I’m like a broken record stuck on “feel how soft my skin is”. It still amazes me why I am always surprised by this simple skin softening trick. With Spring just around the corner, set aside a half hour for a mini mani and pedi. No-one likes the look or feel of scary hands or feet, and whilst it’s easy to let this part of your body get a little worse for wear, it’s not so difficult to make them looking pretty again. My tootsies would be claiming another owner if I didn’t do a regular preen and primp session with the following essentials. So, there you have it. My top-to-toe winter home-spa sessions. I know my husband is not-so-secretly looking forward to it too. A month of let’s get naked and paint each other in coconut oil, finger licking cacao masks and body oil. Hello! What sane person wouldn’t sign up for that?! Did I miss anything out? If you have any other suggestions I’d love to hear from you in the comments below. What are you getting up to this August? This entry was posted in 'Me' Time, Beauty Care, Relationships and tagged argan oil, beauty, coconut oil, hair care, home spa, nail art, nails, natural, organic, skin care, spa, vegan, winter. Bookmark the permalink.